Mark O’Connor does not like Shin’ichi Suzuki. For those who don’t know, Shin’ichi Suzuki is the originator of the Suzuki Method. Suzuki’s method teaches ear-training and musical technique to very young music students. The Suzuki instructor introduces increasingly complex pieces in sequential books. Everybody in the Suzuki Cult learns the same material and wears the same robes. This systematized approach has led to thousands (more likely millions) of musicians learning all the Suzuki repertoire. I’d bet four out of five people in a given pro orchestra could still play Suzuki tunes from memory. I sure can. The Suzuki Method basically develops technique by way of massive amounts of repetition along with obedience-based learning (follow my hand, do as I do, I am always right and you are always wrong approach) that has spawned the least creative 50-year era in violin history. 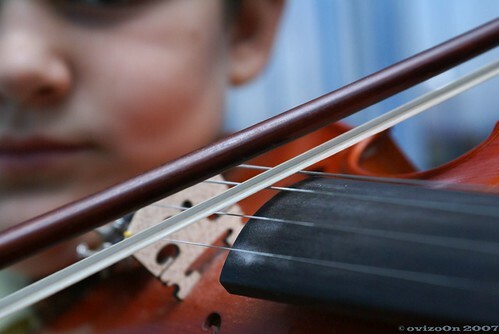 All other major instrument groups have grown to rival the violin’s preeminence over the same amount of time both in classical music and popular culture. Suzuki is by the far and away the dominant violin teaching method of the last 50 years. O’Connor also says The Good Doctor trumped up his association with Berlin violin teacher Karl Klingler, stretched truth in saying he knew Dr. Albert Einstein (a noted violinist, in addition to whatever else he did), and made up the fact that he had a PhD. Basically, O’Connor thinks Shin’ichi Suzuki was a huckster with trumped-up credentials looking to sell violins & method books. If you read this site regularly you know these are the types of people I’m most fascinated by. But the Suzuki Method has been successful because it’s easy to understand. People get it. You start from scratch, build steadily, learn the same stuff your friends do, and end up knowing a great deal of music by the time you’re 11 or 12 or whatever. O’Connor might be the imperfect vessel for all this information — although I secretly appreciate the joy he takes in lambasting Suzuki’s musical chops — but he has hit on something. Best case scenario: you get a good teacher who mixes in Suzuki numbers with other stuff, pushes the student in all directions, and ultimately lets her roll with whatever works best. So in the end, this is really a story about either a questionable biography, character assassination, or both. Welcome to the world of classical music.